Sugar Plum Party tickets available at WSPA office only. Ticket cost is $15. My name is Elizabeth Nip, and I am 9 years old. I am a 5th grader at St Anne School in San Francisco. I started dancing at WSPA when I was 3 years old. Even back then, I knew that I never want to stop dancing. Everywhere I go, I dance- on my way to class, walking from the car in the parking lot or on the sidewalk and even when I am eating! I probably even dance in my sleep! When I was 4, I joined the Ballet and Tap Performance Programs and my teachers were Ms. Tina and Ms. Amy. When I was 7, I had my first Ballet solo with Ms. Tina. This year, I am in the Professional Program for Ballet with Mr. Viktor; Lyrical and Pointe classes and a Ballet solo with Ms. Tina; and Jazz class with Ms. Maia. I am dancing more than 16 hours every week. My favorite kind of dance is ballet. It looks easy, but it’s the hardest of the three that I take. I like the challenge, and it really gets me to work hard in class. Being Clara in this year’s Nutcracker is a dream come true! I am so thankful for this opportunity and very excited to share this story with so many, especially those who will be watching the Nutcracker for the first time. I will also be dancing as a Guardian Angel, a Russian Maiden, and a Dew Drop. My advice to young dancers is to always work hard and believe in yourself. Dance because you love it, and always do it from your heart! Hi my name is Annaleigh Mar. I am 13 years old and in 8th grade at St. Robert Catholic School in San Bruno. I dance ballet and lyrical six days a week for at least 15 hours. I also used to do tap but my schedule got too busy. If I was asked to pick one favorite it would have to be lyrical because it gives me freedom to express myself through dancing. I will be portraying the roles of Clara, Russian Maiden, Snowflake, and Geranium in the Nutcracker this year. During the auditions for Clara, I wasn’t too nervous because I had auditioned several times before. I already knew that all I had to was walk into the studio confident and do the best that I could. Later on in dance, I would love to be the Snow Queen because it is such a beautiful dance and I have loved it since I was a little girl. To all young dancers, “If you can dream it, you can do it”, Walt Disney. 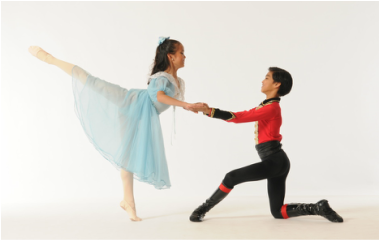 Jasmine Cruz as "Sugar Plum Fairy" and "Doll"
Sabrina Yap as "Sugar Plum Fairy" and "Doll"
Sabrina has been dancing since she was 5 years old. She attended ballet classes at CPAA Arts Center, San Francisco Ballet School, Bayer Ballet Academy, and is now studying under Mr. Kabaniaev in the professional division of WSPA. She performed in several different productions, including San Francisco Ballet’s Waltz of the Golden Hours in Coppelia and the Nutcracker as a clown and a butterfly, as well as lead roles in Bayer Ballet’s winter and spring shows. In WSPA’s Nutcracker last year, she was a butterfly, and this year, she will be performing the role of Doll and the Sugar Plum Fairy for the first time. Sabrina received multiple summer intensive scholarships and was invited to study year round in the Bolshoi Ballet Academy of Moscow and the Kirov Academy of Ballet in Washington D.C. after attending their summer programs. She competed in YAGP for three years, placing in the top twelve of the regionals each year and awarded 2rd in the SF regional’s Junior Division in 2013. Guest Artist Rudolph Capongcol as "Snow King" and "Cavalier"
Erik Debono as "Snow King" and "Cavalier"
Erik is performing as the Snow King and Sugar Plum Cavalier for the first time. 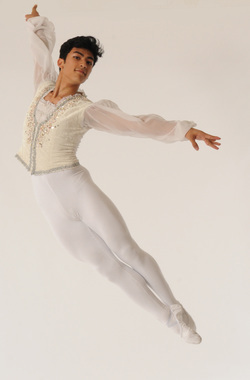 He started dancing at age of 6 and is currently in the Ballet Professional Division at WSPA training under Viktor Kabaniaev. He also trains in ballet and contemporary at Ruth Asawa School of the Arts (SOTA), where he will be graduating this coming spring. In the past two years he completed the Joffrey Ballet School intensive and the California State Summer School for the Arts program (CSSSA). He has placed in competitions such as YAGP, NYCDA, JUMP, TDA, Showstoppers, and ONSTAGE, winning several awards including top male dancer. He has been awarded scholarships from several dance majoring colleges in New York at the YAGP Regionals, NYCDA Nationals and CSSSA. He has performed in multiple shows including Nygel Lethgoe’s Dizzy Feet Gala in LA, the SF Ethnic Dance Festival, Labayen Dance/SF, and lead roles in several musical and Opera productions at SOTA and WSPA. 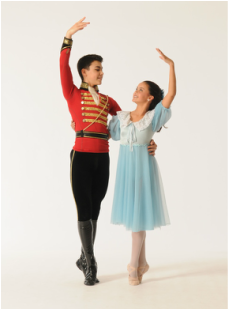 On the second weekend of December he will be performing in Reno as the Young Prince in AVA Ballet theatre’s Nutcracker. He is thankful to Ms. Malu and all the teachers that have helped him grow to where he is now.